Every year I team up with OXO to spread the word about Cookies for Kids’ Cancer. The past few years I have always made cookies, but this year I decided to make something a little different; brownies. 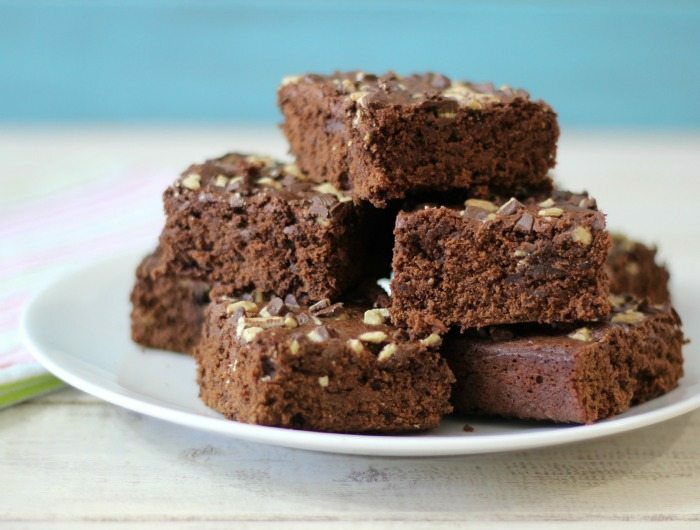 After all what child or adult doesn’t like brownies? 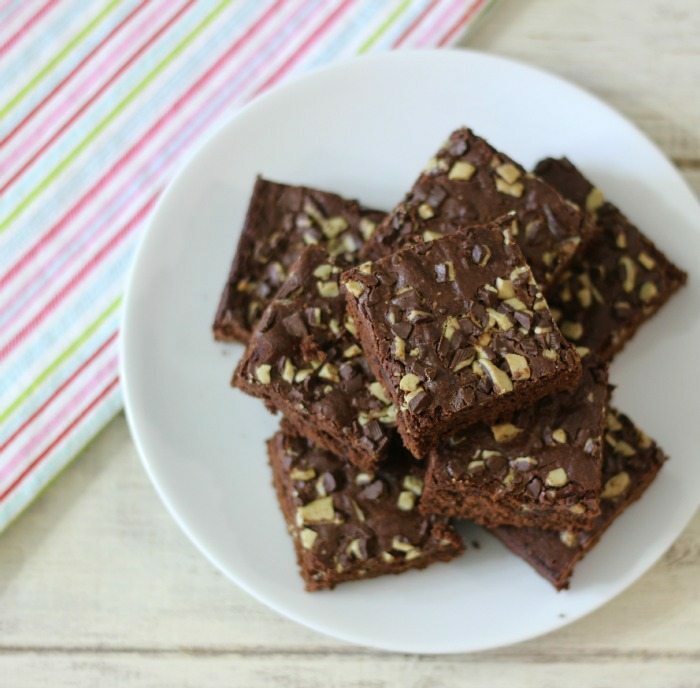 My brownies, are rich, chocolaty and topped with one of my favorite candies, Andes Candies. 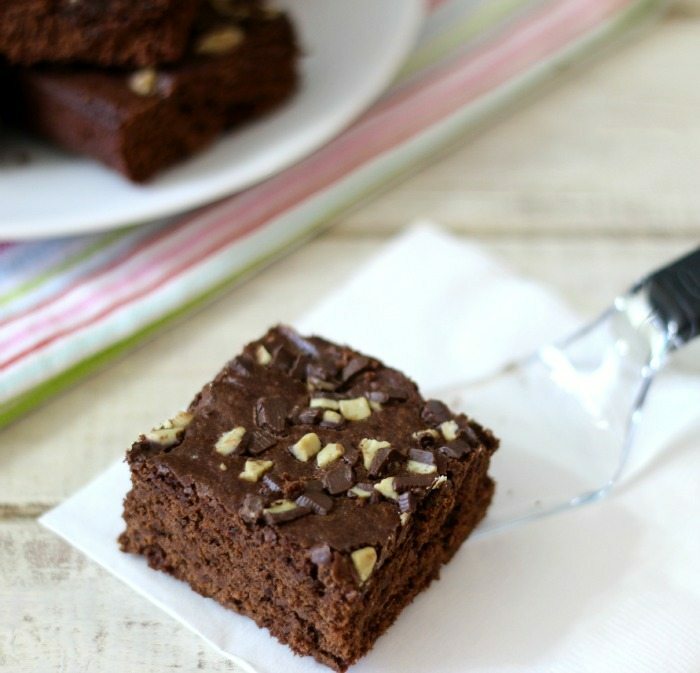 These brownies will be loved my chocolate mint lovers everywhere. Making the brownies is so easy! I just melted some butter, added the sugar and then added my remaining ingredients. It’s nice because it’s basically a one pan deal. The only other pan I needed was my OXO Good Grips Non-Stick Pro Cake Pan in a 9″ x 13″. This pan is fabulous! 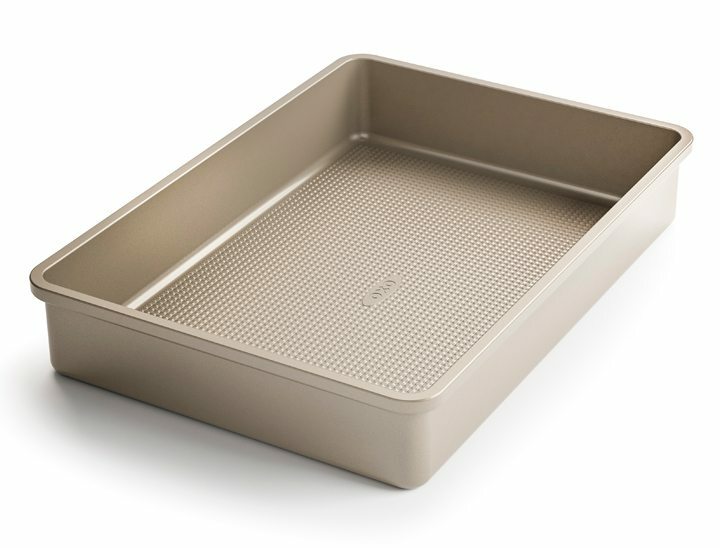 It has a micro-textured pattern that adds structural rigidity, and minimizes surface contact to improve airflow for even baking. My brownies were perfectly baked, plus it as nice rolled edges, it’s sturdy, non-stick and simply perfect for brownies, and cakes. I love my pan! It will come in use for holiday baking. The recipe makes for 24 two-inch size brownies. 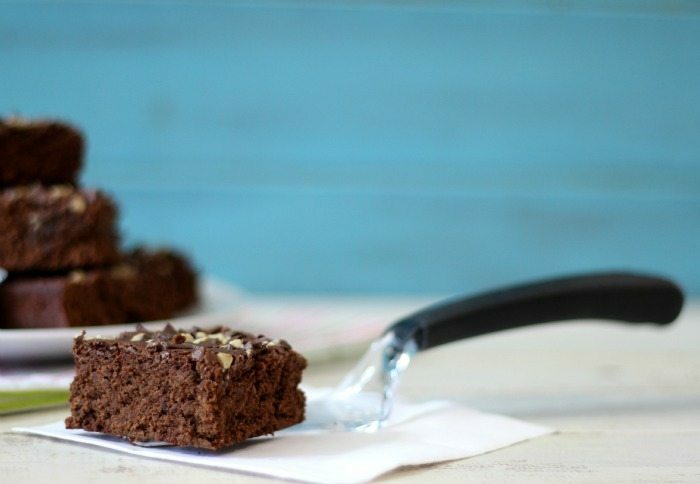 For cutting my brownies I used OXO Good Grips Brownie Spatula. The Spatula is amazing. 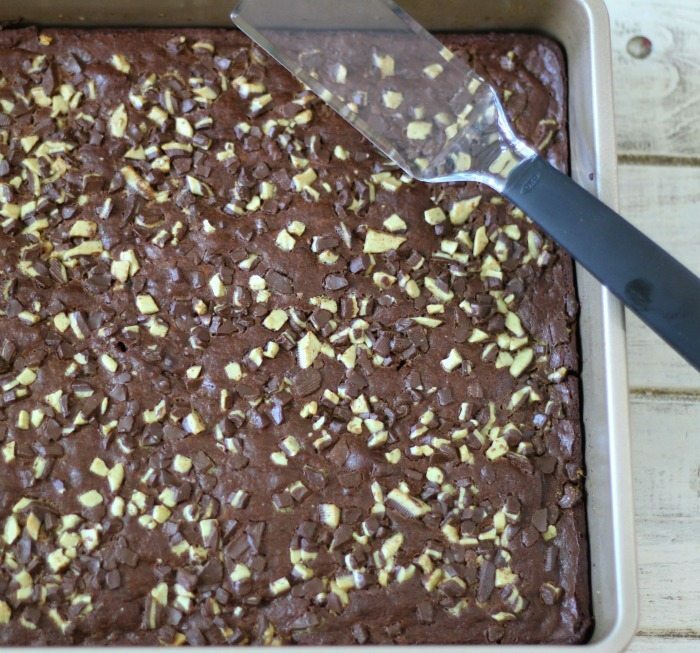 It cuts the brownies like a dream and my favorite part is that lifts the brownies out of the pan without any hassle. If you make a lot of brownies, this is a tool you must have and it’s only $4.99. I was so excited, that I totally forgot I had the OXO Good Grips Baker’s Dusting Wand. This little wand is perfect for dusting powdered sugar on your brownies, pancakes, waffles, cakes and cookies. It’s the perfect size that fits in my drawer very nicely. Not only did I make this recipe for a good cause, but I also made them for my co-worker for his Birthday. His favorite flavor is Creme De Mint and he loves Andes Candies. I remember we went to an ice cream shop after lunch and he ordered the Creme De Mint Milkshake. We stood there watching them make the milk shake and I kid you not, our jaws hit the floor when the waiter put 6 heaping scoops of ice cream in the milk shake. OMG!! It was only a 12 oz. size shake. At that point we realized we will never order a milkshake again. It was crazy. So I decided to make these brownies for him instead. I hope he likes it as much as we do. But you know what? 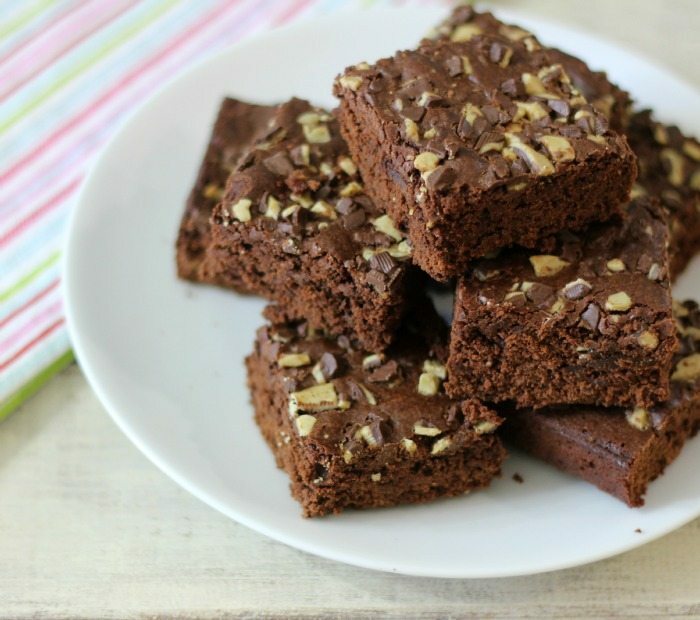 These brownies taste great warmed in the microwave and served with just a single scoop of vanilla ice cream. Yum!!! A rich, chocolaty brownie topped with Andes Candies. In a large sauce pan over low heat add butter until melted. Add sugar and stir until combined. Take off of the heat. Add cocoa powder, salt, and vanilla extract. Stir until well combined. Add eggs and stir until completely incorporated. Stir in flour until combined. Do not over mix. Pour batter into prepared pan. Sprinkle with Andes Creme De Menthe Baking Chips on top. Bake in oven for 35 minutes until center comes out clean and brownies slightly pull away from the edges. Let cool completely and cut into 24 squares. I wanted to give you a little information about Cookies for Kids’ Cancer. Since I made this post OXO will be donating $100 to Cookies for Kids’ Cancer on my behalf. I am really proud to be apart of this campaign every Fall. However, this is something that we should be apart of all year. If you want to help Cookies for Kids’ Cancer; look for the sticker (see below), which you can find on select OXO baking items. Here is the sticker. I hope you all have a wonderful, sweet day! Remember when you go shopping for kitchen products for yourself or to give as gifts, look for the OXO green sticker. Each product with the green sticker that is bought, OXO will make a donation to Cookies for Kids’ Cancer.